One of the ways Atlanta messed up with the proposed Gulch project is with ownership. All the subsidies we’re providing, which are coming through the Westside Tax Allocation District (TAD), will go towards privately-owned infrastructure such as the giant parking podium and the private streets inside the project. We should be asking developer CIM Group to build bike paths on nearby streets or to pay for repairs to the nearby Five Points MARTA Station. CIM isn’t improving the public realm at all, and the city will have no ownership of the things that are being subsidized. That’s wrong. 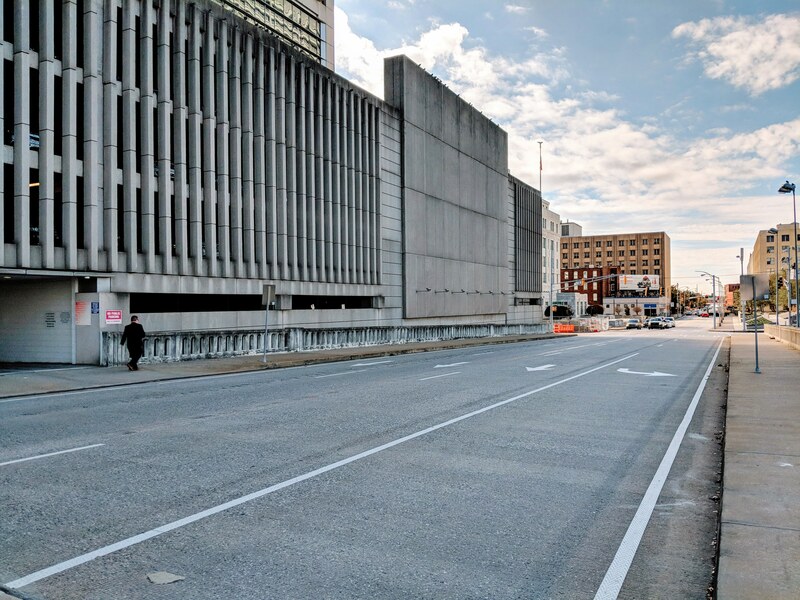 Look at the photo of Ted Turner Drive below, where the Gulch development will sit (just to the right, out of frame). It’s a grim stretch of road with no greenery or bike lanes. Instead of improving this road that we own publicly, we’re improving a piece of land that will be owned privately, beside it. 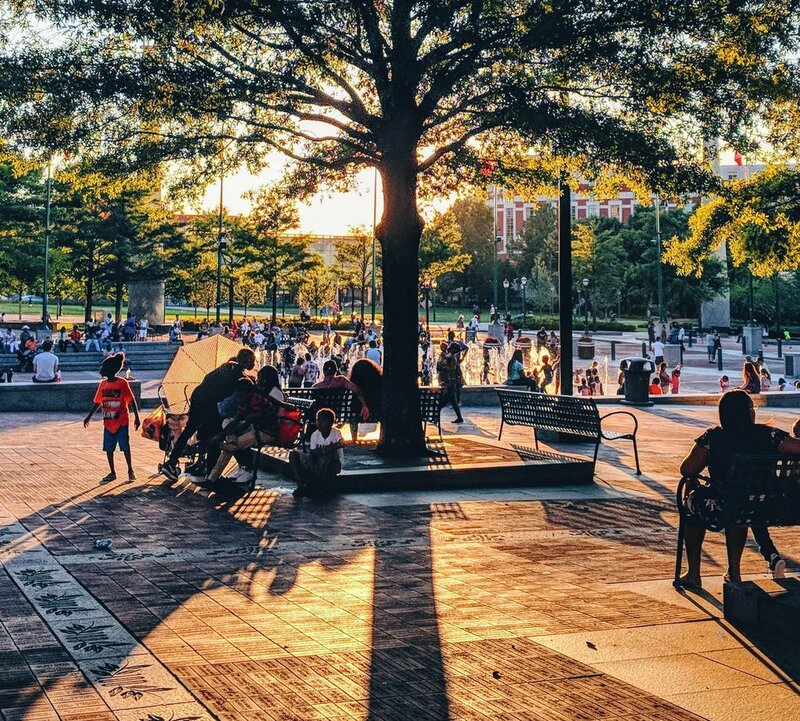 The TAD was originally created to fund Centennial Olympic Park, a public improvement. Then we started funding private improvements, which clearly conflicts with the spirit of the plan, and leaves us financing private development when we could be getting some public investment out of this. Compare that situation in Atlanta to a recent news item out of Chicago. There, four sites that were up for the Amazon HQ2 location, just like our Gulch was, are being eyed for big developments that would be spurred by a cumulative $1.7 billion in public subsidies – also a familiar scenario for Atlanta. Except in their case, developers benefitting from the subsidies will be asked to bankroll public infrastructure improvements to roads and transit in Chicago, instead of just private development. They’re going to have ownership of the results. It’s also important to note that Chicago’s population is 2.7 million, compared to the City of Atlanta’s 486k. The subsidy-per-capita is off the charts in Atlanta with the Gulch deal. Atlanta has hit a new low when it comes to bad practices in economic development. Thanks to City Councilmembers Andre Dickens, Natalyn Mosby Archibong, Amir Farokhi, Jennifer Ide, Matt Westmoreland, and Howard Shook. All of them saw enough of the fault in this bad Gulch proposal that they voted ‘no’ a couple of weeks ago. They did the right thing. Unfortunately, there were still enough ‘yes’ votes that it passed. Basically the thing that passed is the same proposal that CIM Group originally offered. Aside from some small amendments, there have been hardly any substantive changes to improve it since the deal was first announced — except for the Westside TAD not being extended another 10 years. No guarantee of private streets that offer the exact same access and engagement that we expect from public ones. No guarantee that there will be room for commuter rail and a platform (see comment below for one small amendment that at least gives a nod to this). No formal Community Benefits Agreement with surrounding neighborhoods. No improvement to the affordable housing supply as listed in the proposal. We’re disappointed by a vote from Council that fails to address solid concerns about the effect a public-supported project will have on urbanism and on the importance of TAD incentives for public-owned spaces. Is this all over? Possibly not. The”Redlight the Gulch” group that vocally opposed the deal doesn’t consider City Council’s greenlight for the proposal to be the end of the fight.